Always get a pigmented lesion checked if there is any change at all. 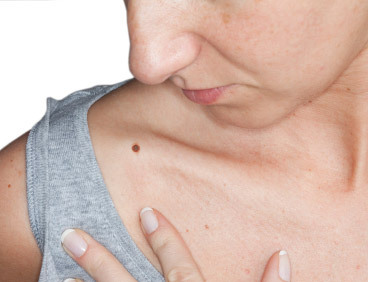 There are typical things that you should look for in evaluating moles or lesions on the skin during self checks. These are the ABCDEs. A: Asymmetry – One side is not like the other. If you draw a line through the mole, the sides will not match. 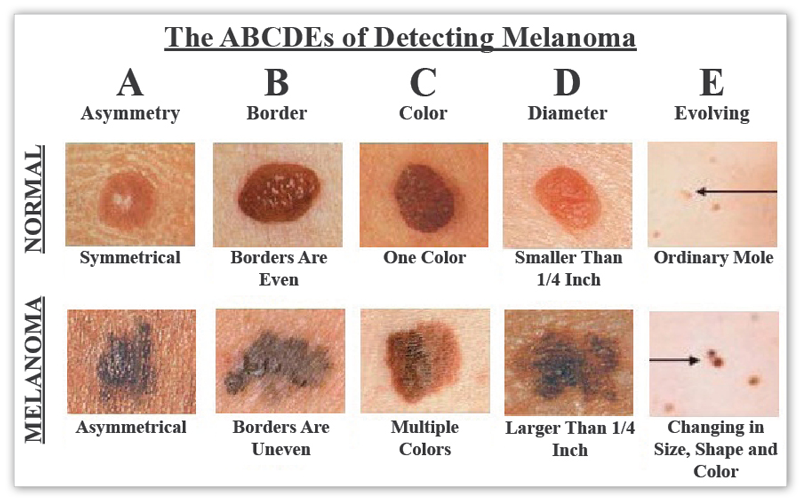 B: Border – The borders of an early melanoma may be uneven. The edges may be scalloped or notched. D: Diameter – Melanomas usually are larger in diameter than the size of the eraser on your pencil (1/4 inch or 6 mm), but they may sometimes be smaller when first detected. E: Evolution – Any change — in size, shape, color, elevation, or another trait, or any new symptom such as bleeding, itching or crusting — points to danger. This entry was posted in Skin Cancer on 9 January, 2014 by Dyersburg Skin and Allergy Clinic. Actinic Keratoses (AKs) are very common. They are one of the most common reasons for office visits. 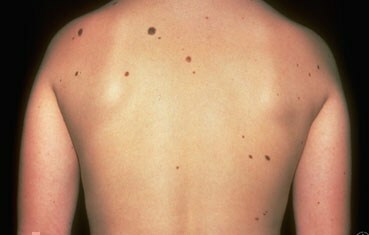 They are sometimes called solar keratoses because they are caused by years of sun exposure. Most are dry, scaly and rough textured. Some are skin colored and more difficult to see. They are usually sandpaper like and are in groups that cover large areas of skin. Some can appear as red bumps, thick red scaly patches or growths or crusted growths varying in color from red to brown to yellowish black. Sometimes AKs grow rapidly upward from the skin and develop a growth that resembles a horn. When this happens, the AK is called a cutaneous horn. Horns vary in size and shape. They are common on men’s ears. They are typically considered cancerous as the base of the horn has a higher likelihood of cancer. Treatment of AKs is important to prevent development into skin cancer. AKs typically form in areas that receive the most sun. Cryosurgery: This is the most common treatment. This involves freezing the AK with liquid nitrogen, which will make the skin blister and flake off. Chemical Peeling: A chemical solution is applied to the sun to peel away the AK. Chemotherapy for the skin: A prescription called 4-fluorouracil can be written. This is a cancer fighting cream that you apply to the AK to destroy it. Immunotherapy for the skin: A prescription cream called imiquimod cream – works with the body’s immune system to help destroy AKs. NSAIDs for the skin: Sodium diclofenac gel is a medication that destroys AKs. 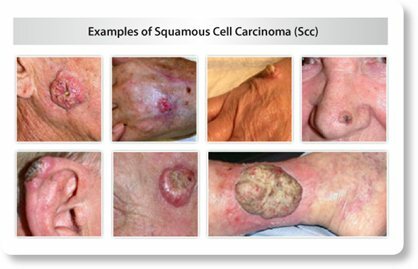 Squamous cell carcinoma (SCC) is the second most common type of skin cancer. If this type of skin cancer is detected early, it can be cured with treatment. SCC can appear in many different forms. It can be a bump that feels crusty and rough, a flat patch that is red and rough, a dome shaped bump that grows and bleeds or a sore that does not heal or that heals and returns. Most of these types of skin cancer develop on sun exposed skin but they can develop in areas that are not exposed to the sun as well. 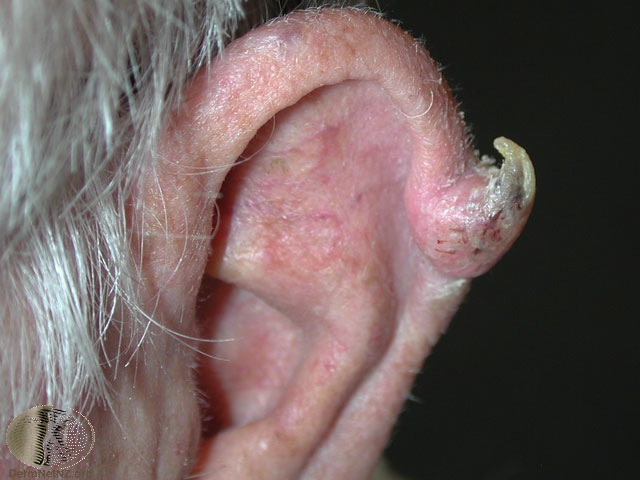 Some begin as a precancerous growth called an actinic keratosis (AK). AKs are typically dry, scaly and rough. They can be very small or even as large as a quarter. 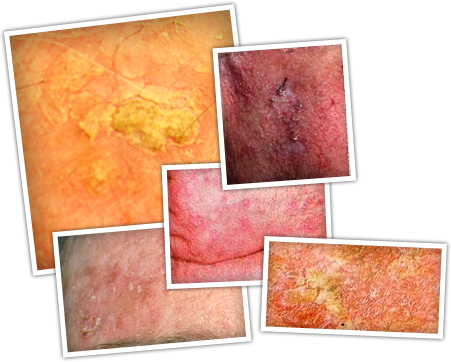 Although SCC can develop on anyone with any skin type, there are certain risk factors that make it more likely for you to develop an SCC at some point in your life. This is more common in caucasians. UV radiation causes damage to the skin and makes it more likely that a skin cancer will develop. As damage accumulates, risk increases. Risk also increases with time because more exposure occurs over time. Early detection provides the best treatment options for SCC. 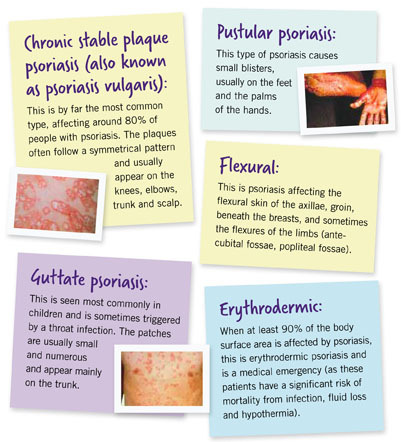 If it is not treated, it can spread to other areas of the body and make it more difficult to treat. A biopsy must be performed to get an accurate diagnosis. To have the biopsy performed, numbing medicine is injected into the skin surrounding the possible skin cancer. A sample of tissue is obtained and sent to a pathologist to view under the microscope. The diagnosis given by the pathologist will determine treatment options. The options available depends on how deep the skin cancer is, how large it is, and whether or not it has spread to other areas. Excision – Surgical procedure performed in office. This is performed in the same fashion as the biopsy, with local injections of numbing medicine. The area of skin containing skin cancer, along with normal looking skin is taken off and sent to the pathologist to look at under the microscope. The pathologist will determine if any cancer cells are in the normal looking skin. If there are no cancer cells, then we say that the margins are clear and no further treatment is needed. If there are cancer cells present, more treatment will be needed. Mohs Micrographic Surgery – Surgical procedure performed in the office under local anesthesia. This means that injections are given into the skin and you will be awake for the procedure. The surgeon will remove the area of skin that is affected by cancer and a small amount of normal looking skin. He or she will then look at the sample under the microscope immediately to determine whether or not margins are clear. If they are not clear, more skin is taken and the process is repeated until all margins are clear. Radiation – When a person cannot undergo surgery to treat a skin cancer, they may be sent for radiation therapy. A series of radiation treatments are used to destroy the cancer cells. Medicine applied to the skin – If caught early enough, a prescription medication can be given to be applied to the skin at home to destroy cancer cells. Cryotherapy – For superficial SCC, those just on the surface of the skin, liquid nitrogen can be used to destroy cancer cells. A very cold air is applied to the skin, usually by spraying from a canister to “freeze” the cancer cells to destroy them. BCC is the most common form of skin cancer. Millions are diagnosed each year and nearly all are cured with treatment. Most BCCs develop on sun exposed skin such as the scalp, neck and hands. It is especially common on the face – on the nose, cheeks and forehead but can develop anywhere on the body. Anyone can get BCC, but there are risk factors that make it more likely that you will be diagnosed with BCC at some point in your life. Lighter skinned people tend to develop BCC more frequently. Damage to the skin occurs through UV exposure, either from the sun or from tanning beds. Over time, this damage accumulates and increases the risk of developing skin cancer. The risk does increase with age because the older you are, the longer you have been exposed to UV radiation. 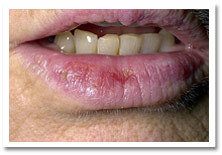 BCC is serious because it can grow deep enough to affect bone or other tissue. It rarely spreads to other areas of the body, however. A deep or invasive BCC can be difficult to treat. If caught and treated early, BCC is highly curable. Treatment cures most BCCs. To diagnose a BCC a biopsy will be performed. This is the only way to diagnose any type of skin cancer. The biopsy will be performed under local anesthesia, which means that the area of skin to be biopsied will be numbed with injections of lidocaine. The tissue sample will then be sent to a pathologist to be examined under a microscope. If the diagnosis is BCC, there are many factors that will determine the appropriate treatment. Excision – Surgical procedure to remove the BCC along with normal looking skin to ensure that all of the cancer cells have been removed. This is sent to the pathologist for confirmation of clear margins, which means that there are no remaining cancer cells in that tissue that remains. If the normal looking skin contains cancer cells, more treatment is necessary. Mohs micrographic surgery – Mohs is usually performed at a medical office under local anesthesia while you remain awake. The skin cancer, along with some normal looking skin is removed. The sample is then examined under the microscope to determine whether or not cancer cells remain, and where those cells are. This will direct the surgeon as to where to remove more skin sample, if necessary. This process continues until there are no cancer cells remaining. Radiation – When surgery cannot be performed, radiation therapy may be recommended. A series of radiation treatments are performed to destroy the cancer cells. Medication applied to the skin – When BCC is caught very early and is superficial, medication may be applied to the skin at home to destroy cancer cells. This entry was posted in Skin Cancer on 8 January, 2014 by Dyersburg Skin and Allergy Clinic. What do TCA Peels do? TCA peels are considered medium depth peels. Strengths can vary, but we typically use two strengths: 25% and 35%. TCA peels even out skin tone and can make your skin appear brighter. This type of peel reduces hyperpigmentation (dark spots) and other discoloration. TCA peels exfoliate the skin and clear out clogged pores. This type of peel also works well for fine lines and sun damage. TCA peels will give results after only one peel, but more than one peel is typically required and results last about 6 months or so. You can supplement TCA peels with glycolic acid peels to make the effects last even longer. 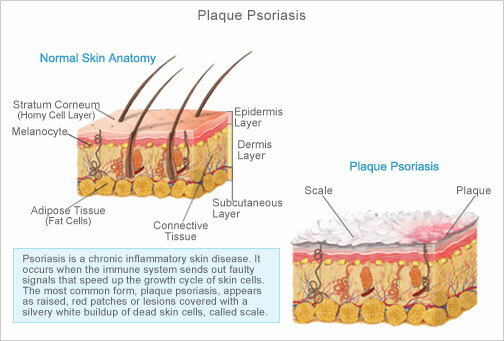 This entry was posted in Chemical Peels on 7 January, 2014 by Dyersburg Skin and Allergy Clinic.